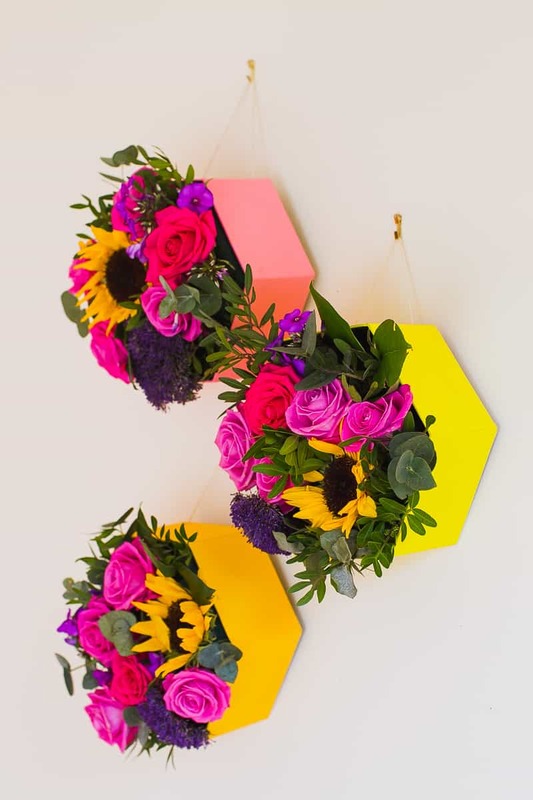 MAKE THESE HEXAGON FLOWER BOXES FOR A POP OF COLOUR ON YOUR WALL! Paint your hexagon boxes in whichever colours you choose! We decided to give them all a white coat first so that the colour would pop more! Once your paint is dry, take a pencil and mark a small cross on each side of your hexagon, this is for the string to thread through. We marked ours 0.8cm from the back of the box and 1.5cm in from each side. Next drill through the holes. Thread your string through one of the holes and tie a knot big enough so that string does not fall back through the other end. Then, thread the string through the other hole creating a loop ready to hang them and tie a second knot in place. Take your oasis foam and secure it firmly inside the box using your glue gun. We placed two sections in ours, equally spread out so that when we placed the flowers into the foam they would fill the entire box. The fun part! Cut your flowers down to size and start to place them into the oasis foam! You’ll want them to sit as flat down to the foam as possible so trim them to size as necessary and keep adding them in until you’re happy with the arrangement. Depending on your wall hooks, you’ll want to position them securely on your wall, spaced far enough apart so that your boxes don’t touch each other. Then hang them up! This post was made possible thanks to Sereneta Flowers!